Every so often a culture re-assesses its primary operating assumptions. It happens rarely, and for good reasons. There’s great resistance to it. It’s dangerous. And it’s disruptive. At its most disruptive it alters reality. And a new reality is a big deal. We may not have Virgil to lead us, but we have Leopold, Stan Rowe, Whitehead, John Muir, Albert Schweitzer, John Dewey, Goethe, Darwin, Thoreau, and countless others who have inspired others with their collective impatience with the worldview presented to them in their lifetimes, and its inability to make sense of the world they experienced. No mere machine, their world was alive with creativity, emergence, beauty, reason, value; and it was real. Not mere metaphor or secondary qualities. Not simply a conceptual or theoretical tool. Nature alive was for them a reality. To say such things outside of enlightened enclosures is to invite ridicule and disdain. Positivism still reigns in our academic institutions, and presuming to grasp or speak of reality is often considered foolish, and so pre-post-modern. A few years ago, I developed and taught an ecospheric ontology course at one of this country’s premiere liberal arts colleges, where I was a visiting professor. A sophomore philosophy major took my course (I was teaching the course in the Environmental Studies program). When he told one of his philosophy professors about it the student was ridiculed publicly for wasting his time in a “metaphysics” course. So be it. (It was the philosophers in the sixteenth and seventeenth centuries who ridiculed and rejected the emerging scientific worldview at the time.) We must risk and accept such ridicule. And we must remember that behind the current worldview that is causing the world so much trouble is a list of implied ontologies that are now so obvious as to need no overt discussion. One cannot engage in philosophy or any theoretical enterprise without some ontologizing. But new worldviews need singular voices to step forward from the choir to loudly and unequivocally proclaim them as new realities. Such claims sound odd to status-quo ears. “In Wildness is the Preservation of the World.” “Nature Alive!” We need to say such things. But let’s give credit to Bacon, Descartes, Copernicus, Galileo, and Newton. They were giving voice to a new reality too; in stark contrast to the accepted worldview of their time. They took risks in claiming that their alternative models were not just theoretically useful; rather, they claimed in various ways that these models captured the ways things are. What emerged with this new reality were new systems of understanding it (e.g., observation and the scientific method), and new systems of ethical values (rights). Other systems lost their influence. The new system set the standards of education and science and eventually found its way into economics and politics. That this system saw nature as largely dead, rigidly law-like, and machine-like, and humans as self-interested individualized units, were essential to its success. And successful it was, and still is today. Thanks to 150 years of discoveries and syntheses, we have an alternative conceptual model with numerous successes behind it. Nature alive has had many early post-modern adherents. And the results continue to come in. How to continue these successes? Is it sufficient to work only at the conceptual level? Is mere metaphor enough? Could the divine right of kings or human slavery have been confronted with mere conceptual models? Would the Copernican revolution have been a “revolution” had it only been conceived as a mental model that was simpler than the alternatives? Would concepts of private property or human rights have been as successful were they mere conceptual tools. What about germ theory? Is evolution through natural selection a mere model? Is Climate change real? That last question is hotly debated these days in part because the question is deeply ontological. This explains, I think, why the political right has dug in its heals. It understands that there’s a fight going on about fundamental concepts of reality with their consequent epistemologies and value systems. The political right’s worldview is under attack. Is the notion of nature being alive an assertion about reality itself or merely a conceptual tool? If we consider the “or” of this disjunction inclusively, not exclusively, we can say yes to both, and consider how to effect the change of view that comes with assent. For example, we are already seeing successes in applying the conceptual tool in Natural Systems Agriculture, Biomimicry, medicine (micro-biome research), information theory, and ecosystems biology. There is ontological work being done as well (e.g., the work of thinkers like Whitehead, John Cobb, Frederick Ferré, Stuart Kaufmann, Stan Rowe, James Feibleman, and Paul Davies). 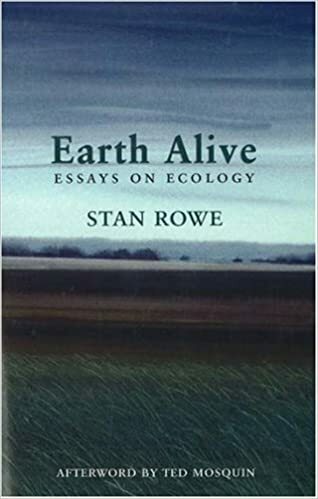 And we are witnessing individual and collective action that embodies an ecosystems/ecospheric approach even if it is not explicit, such as CSAs, intentional communities, and the 10,000 experiments around the world to live as a “plain citizen” of the ecosphere. Educational systems advance worldviews. They too need “refreshment of the imagination.” Our work contributes to this necessary refreshment, and to the influence of educational institutions on our culture’s “coordinating philosophy.” Not solving problems “in” education, but solving the problem “of” education. Modern education is a derivative of, dependent upon, and prepares students for an extractive economy. It trains, molds, creates, and rewards extractive minds. The change we seek to this educational model is wholesale and full-measured. With hands in the soil, minds at work in the lab and the library, and senses alive to a living universe, let’s work to institutionalize this emergent and already successful ecospheric worldview. Bill Vitek is Professor of Philosophy and Chair of the Department of Humanities and Social Sciences at Clarkson University in Potsdam, New York. He is a founding project team-member of The Land Institute’s Ecosphere Studies program and directs the New Perennials Project, housed at The Rockefeller Family Fund.